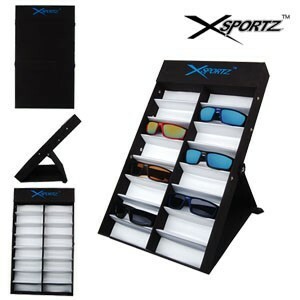 Xsports Brand Folding sunglass tray holds 16 pair of sunglasses. This is a very portable unit for displaying sunglasses easily. This unit does a very nice job protecting the sunglasses from getting damaged moving them. Consider looking at the other wholesale displays for sunglasses here.